There was a song on the radio in the 70’s called “Ball of Confusion”. So even the people of the world are bewildered as to why this world is so crazy. This song asked some of the same questions as this website asks: Have you ever wondered why the world is so evil? Why all the murders? Why all the rapes? The molestations of innocent children? The wars? The sickness and disease? Why suicidal spending in Washington? Have you wondered why so many religions? Why so many differing i deologies? Why so much hatred…and bigotry…and bizarre, unexplainable phenomena? Is all this ball of confusion just an accident? And isn’t there any hope? Well, if you are bewildered at this world’s wickedness, please read this chapter. Hopefully you’ll come away with a bit different view of why all these things are occurring around the globe. OK. I was now firmly embedded in this brand-new private Christian hospital mental ward up in Portland Oregon. I was being terrorized by the Devil(s). Things looked hopeless for me. My parents came up to Portland to see me. My mother looked very troubled over my situation, and stood off in the distance of the little. Maybe there was also something else going on with her. My father began asking how things were going for me. He asked if I was still hearing God’s voice talking to me. He looked puzzled. “Well who’s talking to you, if it’s not God?”. This took my dad by total shock. “WHAT! ?” he exclaimed, as he jumped up. My dad answered, “He said it’s not God who’s talking to him. He now says it’s Satan talking to him.” Upon hearing that, my mom couldn’t take it anymore, and began sobbing as she hurried outside. After that visit with my parents, I was walking back inside, and saw a poster on the wall. It showed a clock, and the following words, “Time to get off drugs.” As I looked at this poster, I noticed the time on the clock hands pointed to, “. “Eight twenty-three? 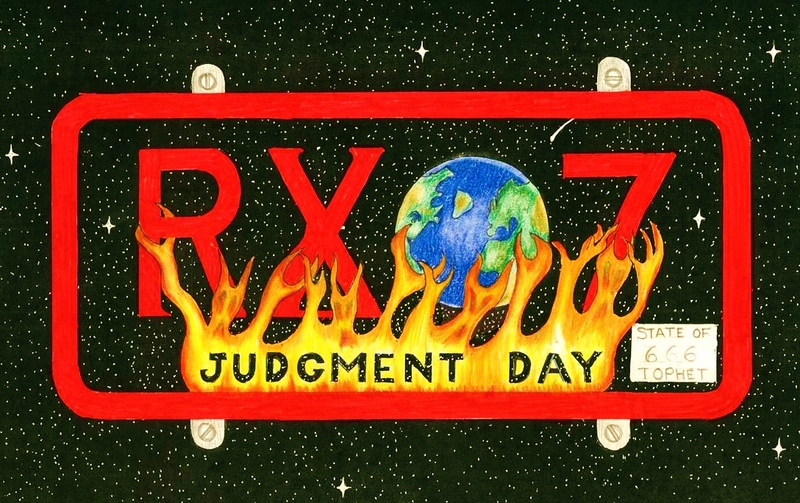 !”, I thought to myself, “I wonder if this poster has anything to do with what Satan was taunting me about back in Guatemala?” (On the last day there, the Devil kept repeating that he couldn’t wait until “The Big Eight-Twenty-Three Skidoo”. Read Ch. 22, “Coming To America”) But I wasn’t taking any illegal drugs. So I couldn’t figure out what this poster had to do with anything. Nevertheless, I just filed this into my memory-banks, as a possible clue to this puzzling riddle by the Devil, concerning “The Big 8/23-Skidoo”. Very mysterious! I had a number of sessions with my counsellor. He was great spiritual help. But there were other counsellors too. The other one I can recall, didn’t believe in Jesus. So he was not much help for me. Maybe he was good for others. I don’t know. One young lady staff-member was talking with me about God. I wanted to know if I was the “The Devil’s Dog”. She told me, “No, there’s no such thing as the “Devil’s Dog in the Bible”. She then began to tell me that God was our Heavenly Father. And as our Father, He has love and tenderness for us, just as a loving father has for his own children. He would never do anything bad to His children. Well, although she didn’t quote any Bible verses, she nevertheless put things in a very nice way. God was a nice loving Father. I wanted to believe her. However, her explanation didn’t fit at all what I had been going through for the past eight months. I had been cast into a whole lot of very fiery situations, so I knew there had to be more to God than just being a loving Father. There must be a wrath-side to God also. I didn’t know hardly anything about the Bible. But there were pieces missing to this mega-puzzle known as God. I also asked the hospital chaplain the same question. He virtually told me the same thing. No Devil’s Dog. I wasn’t totally convinced, but I nevertheless hoped they were correct. However from that point forward, the Devil never tried again to taunt me concerning “The Devil’s Dog”. And so this ended the accusation that Satan clobbered me over the head with, during my “Vacation From Hell” in Guatemala. It wasn’t too long after I arrived, that I discovered the Chapel Room. It was a-ways from the mental ward towards the front entrance to the hospital. It was a very nice hospital Chapel room. I was told that the wall-sized mural had cost $10,000 (about $30,000 or more, in today’s money), and was just recently painted. And it had to have been just painted. You see, it had Jesus standing in a meadow with His outstretched arms. But in the background to the left behind the tree, was the smoke from the recent volcano rising up from the horizon, just as I had seen it rising outside the hospital, a day or two earlier. So it had to have been painted in the last 30 days or so. Anyway, I began to go there often to pray. It wasn’t too long into my stay, that a field trip was planned. And so we all got into a hospital van, and headed east… to Multnomah Falls. The falls are beautiful and very dramatic, as you can see in the photo. There was a historical ledger at the park, which told the story of an Indian who jumped off the falls to save the rest of the tribe from a sickness. I’m not sure how my spirits were, on this outing. But I’m sure they weren’t far! What I didn’t realize, is that I would come back to this falls in just a few months… TO JUMP OFF! Photo courtesy kelvin kay for wikipedia share-alike license. Click for link. A THINNER ME… But this little exchange of a hospital staff trying to get a very thin person to eat, was just a harbinger of the future. And NOT just the future of Karen Carpenter’s… BUT MY FUTURE AS WELL!! Because little did I know, but this was exactly what lay in store for me too! I never dreamed that in the future, I too would be afflicted by a similar problem, dipping below 100 pounds myself! I actually looked like a walking skeleton. Little did I know that a hospital staff would likewise be trying to force me to eat, exactly as this staff did to her! And in the future I’d be finally committed to the Dammasch State Mental Hospital. And I would be tormented by demon angels, while confined for three months with liquid fed me through my nose! Not only this, but while in the hospital, the other patients would prophesy about my future. This was to be a very satanic experience. And my weight problem was due to evil angels. But this was all to happen in the future. And if you do get a chance to hear my similar story, you too might likewise decide that some “eating disorders” are spiritual problems, and not just “psychiatric”. 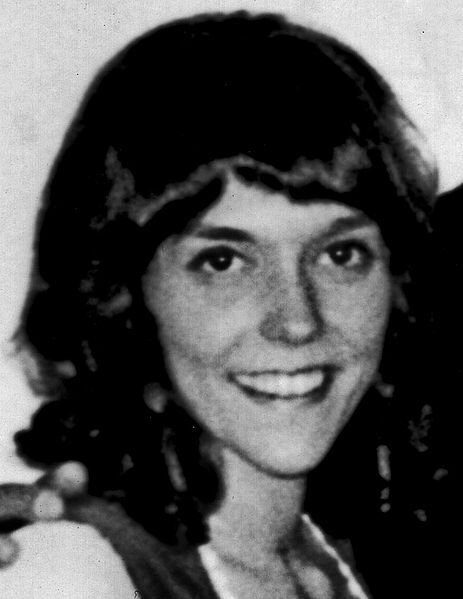 Karen Carpenter photo courtesy wikipedia & Carpenters under share-alike license, Click for link. One day as I was in the prayer chapel, the spirit began to suggest that I was not Adolph Hitler. He began to suggest that I was, as he originally claimed… Jesus, in a previous life. But I was very leery at this point. He had done way too many flip-flops in the past. And so I thought of something. If I really was Jesus in a former life… then…make me write that statement on that expensive new mural of Jesus. 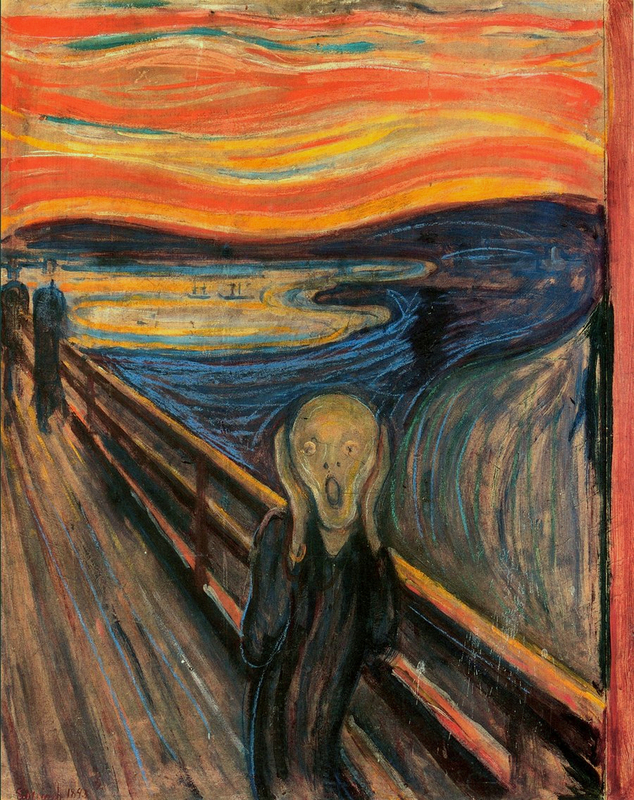 I thought to myself, “God would never allow me to write that statement on this very expensive, and very holy painting.” And so I sat there waiting for him to compel me to do this deed. And sure enough, in a few moments, I found myself under his power, getting up. I went straight for a pen laying by a guestbook. I walked toward the mural. I began to write (the spirit controlling me) the following words on this mural, in very tiny letters,“Chuck was….” I stopped for a moment. “I don’t want him to give this spirit “wiggle room”. So he had me write,“Chuck was the ORIGINAL Jesus in a former life”. Well, as you can imagine, this really relieved me. This proved to me that I wasn’t Adolph Hitler! I probably cried tears of relief at this moment! Well, this event in that Prayer Chapel that day, ended all that Hitler stuff. Up to this day, I’ve never been plagued with the assertion that I was Adolph Hitler in my last life. Now just because my Adolph fear was put to rest is not to say that I was Jesus in a former life. That false notion also came to an end, eventually. One day as I was talking with my counsellor, I asked him how Satan could do all these things to me. This young man with an Abraham Lincoln-style beard began to tell me a story from the Bible. He told me about a man named Job (pronounced with a long “O”). Job was a rich man who loved God. But the Devil took everything away from Job. So Job spent months going through illness, and heartache. And Job was tempted to curse God, because of all the evil that the Devil brought upon Job. “THE” DEVIL OR JUST “A” DEVIL..
Another important issue should be mentioned. At some point in time, I learned that the Devil had many “unseen helpers”. These are fellow angels that fell from grace long long ago, at the same time that Lucifer fell. These “Evil Angels” now roam the Earth, under the leadership of Lucifer, doing their evil deeds and manipulating and orchestrating the events of the world, in order to carry out his evil master-plan; which master-plan is detailed within the pages of Scripture. From what I was told, there are millions, perhaps billions of these devils running around on this Earth. 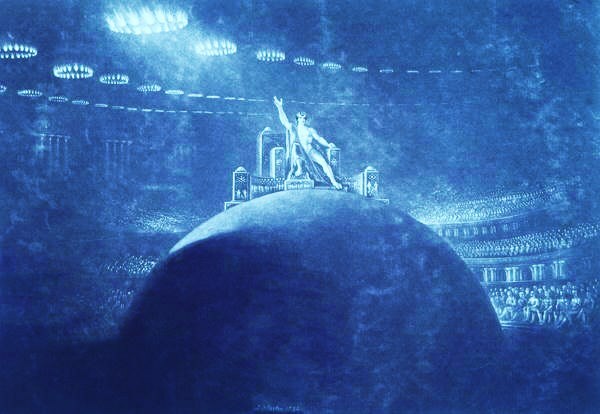 Engraving by Gustave Dore, from www.creationism.org, public domain. Click here for gallery of Dore’s Bible pictures. And so at the very beginning, God put a curse on Lucifer. God was not just talking to the serpent. He was speaking to Lucifer who came to Eve through the serpent; making it seem to the woman that it was the serpent speaking, when it was really just old “L.S.D.” (Lucifer, Satan, the Devil). And so if God put a curse on Lucifer, then there was nothing Lucifer could do to escape that curse. HITLER… Well doesn’t it seem orchestrated? I mean, it’s like…how could Hitler mesmerize an entire nation to get behind his demonic attempt to take over the world? I have a neighbor who was a little boy in Germany. He told me that he, as well as the entire nation of Germany, believed that Hitler was some sort of “deliverer” to help bring about good into the world. And it wasn’t until Hitler was crushed by the Allies, that my German neighbor and his fellow countrymen woke up to just how evil Hitler really was. And how could the people in Africa be mesmerized in just a few months, to carry out that hateful and ruthless act of slaughtering thousands of their fellow humans and countrymen; neighbors, who just happened to be of slightly different blood-line? I saw an interview with one of the men involved in this mass slaughter. He confessed that he and others were brainwashed by those who were in charge of this brutal mass-murder. And after it was all over, he woke up to the reality of the atrocities that he and his fellow countrymen had committed. And then he felt really bad about what he’d done to these innocent men, women, and children of the Tootsies. So how could this be? How could an entire throng of people be so easily manipulated, if there was no Satan and his evil fellow angels working behind the scenes, to inspire madness in the hearts and minds of these aggressors? Well, these are just two examples of the well-orchestrated evil that has plagued Mankind. I could give a lot more. And so could you, no doubt! Nevertheless, it seems like there is an orchestrated effort to erase Satan out of existence. Most don’t even want to acknowledge that there is a Devil; even many Christians have joined in this effort. Even many in the Christian community will start pointing the accusing finger, if you speak about Satan. “Oh we’re not supposed to be talking about Satan.” Well who says? There seems to be some unwritten rule regarding this. The Bible doesn’t say anything like this? I agree, we’re certainly not to become obsessed about Satan! Our daily thoughts should be about Jesus and the Bible. These are just two very quick examples of the orchestrated evil in the world. But with some careful consideration, there could be shown, perhaps thousands of examples of Satan’s orchestrated evil the world over. But Satan has done a marvelous job of “erasing his tracks” behind him. And as already stated, he has all but “erased his self completely out of existence” in the minds of most of the Human Family. I heard someone say that the greatest feat that the Devil ever performed, was to convince the world that he doesn’t exist! Well, I think that even greater than that was when he convinced much of the world that God doesn’t exist! Hey, at least let’s just look upon this subject “narrowly” as it says in the above verse. At least let’s give credit where credit is due! I spent a lot of time blaming God for everything bad. How come the Devil rarely gets the blame? And he’s the one that’s behind most of the evil on this fallen planet! But it seems that Satan gets let off the hook almost 100% of the time. Why? 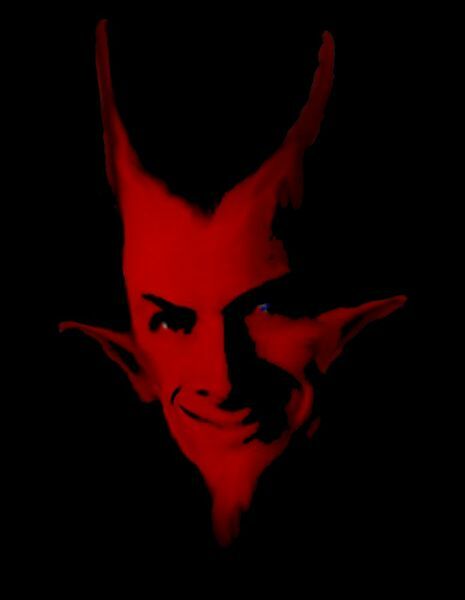 It seems like anyone who even mentions the Devil is immediately scorned, as if he’s saying, “The Devil made me do it! The Devil made me do it!” Well, maybe “The Devil made me do it!” is a much truer statement than people think! Maybe, just maybe, the Devil is making a lot of people do a lot of things in this world, that they might not otherwise do! Not that we’re just “little ol’ innocent bystanders“! Not saying that! But when you stand back and see evil coming in and back out again, like the waves of the ocean, it makes you wonder, doesn’t it? At least it should make a person wonder. But hey! People for the most part, don’t like to entertain such ideas. Nevertheless, the almost flawless orchestration of political and social phenomena in this world, is just too well orchestrated to chalk off as coincidental. And the horrendous depths to which so much evil sinks to, makes it quite impossible to believe that there’s no literal Satan! He just has to exist! This extremely evil world is proof-positive that Satan exists! But hey, for the past 8 or so months, I was conversing with an evil spirit on a daily basis! I didn’t need any further proof! Photos courtesy Wikipedia Public Domain. Anyway, back to the story. So as soon as my counselor told me this story of Job and how Job was tempted to blame God, something happened. A strange phenomenon occurred within me. I began to become tempted to blame God whenever anything bad happened. And before I heard this story of Job, it never even occurred to me, that God was to blame! But now, I was always encountering this temptation: blaming God, as did Job. This became a real plague in my life. I began to think of God as a big-meanie-in-the-sky. It got so bad that I began to be tempted to blame God for even a hang-nail, as the saying goes! But these were temptations. I’m not saying I gave into those temptations. But I’m not saying that I didn’t give into a few of them, either. Will Chuck take that final plunge over the falls? Will the voice be gone forever? Read and find out!